31 May 2013, 3:38 p.m. 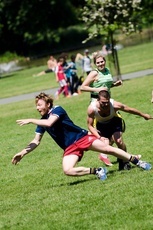 The club will be playing touch rugby throughout summer in Clissold Park, Stoke Newington. The games will start on June 8th and are open to all. Games start at 11am, are played with mixed teams and are completely friendly - although of course no one likes to lose. The game is really easy to pick up and fun for all, we really hope you can join us - no matter wether you are interested in playing the full game or just want to get fit, have fun and meet new people.